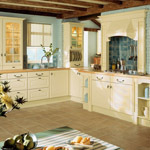 Regency Kitchens is best known for it’s great design, unrivalled quality and personal service. From conception to completion regency kitchens will make the process of buying your kitchen stress free and an ultimately more pleasurable experience. As a company we enjoy a wonderful local reputation amongst customers and traders. And over the ten years of our existence we have built up a healthy partnership with some of finest tradesmen in the industry. We offer a complete makeover renovation service including; Production of new kitchen, removal/fitting, tiling, flooring, building work and plastering. This allows us to control the complete project and cause the minimal amount of disruption to our customer’s lives.